Ever wondered what it was like to run your own games company? Game Dev Story appeared on digital shelves out of nowhere, there was very little coverage about it; a surprise hit. Once it was released however, it quickly gathered steam through word of mouth keyboard online and received mostly positive reviews from purchasers on the mobile markets. The premise of Game Dev Story is straightforward: You start off with a brand new games development studio and have to produce games and work your way up the market. Just like any developer or publisher around today did, even the likes of Electronic Arts or Activision, whom are now giants within the games industry. The game is quite reminiscent of much older games with similar gameplay elements such as the Lemonade Tycoon games though Game Dev Story is quite simplified in terms of what you can actually manage. You start off with a small six-person office and are promptly greeted by your eager secretary who serves as your in-game guide. Initially you can only hire up to four employees who manage different aspects of games development: Fun, Creativity, Graphics and Sound. Ideally you want at least one person to be competent in each area to ensure your games have high levels for each aspect as this influences the 'reviews' your game receives and consequently your sales and income from said game. A game with high fun but low sound aspects, probably an EA Racing game which usually have mediocre soundtracks. The games visuals are very simple and clean, they do an efficient job of showing the collective force of your company and various options. There is no need for flashy graphics on a game like this, especially on a mobile device. Game Dev Story's developers did a brilliant job with the audio which, not unlike the graphics, are simple and functional. The main background music is subtle enough that it doesn't annoy or overstay it's welcome on longer periods of gaming and the little sound effects during game production are neat cues to the different occurrences within the game. 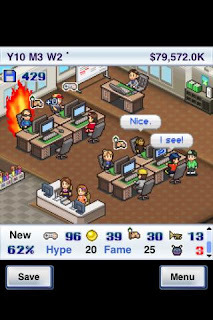 Such as when an employee has a hot streak and adds an extra few points to one of the game in development's aspects, it plays a distinct audio cue which has a retro gaming feel about it. As anyone who has played any recent mobile games might expect, the controls are entirely touch based and they work great, there is never any need for precision aiming, the games menus and dialog boxes function perfectly. It's probably the most optimal control interface for this kind of game, even better than the mighty computer mouse. If you're a natural entrepreneur and play your cards right you can work your way up the amusing parody consoles of each generation such as the 'Senga Uranus' (Sega Saturn) and 'Intendro Whoops' (Nintendo Wii) as the in-game years pass by. Newer and more popular consoles have a higher license cost for developing on but will reward you with higher sales. One of the main ways to level up through the game is to focus on training your staff with 'research data' which is acquired by completing games and projects. Experimenting with different game genres and styles is another fantastic way to improve the quality of your games. The game has 30 years to experience with your company which equates to a fair few hours worth of gameplay. Game Dev Story is a cleverly simple, yet highly addictive and very enjoyable sim-game for mobile devices that doesn't disappoint it's users for what it promises. It's a game that can be played for a short period of time or for longer sessions with that "I'll just do one more level game sequel" feeling occurring fairly often. 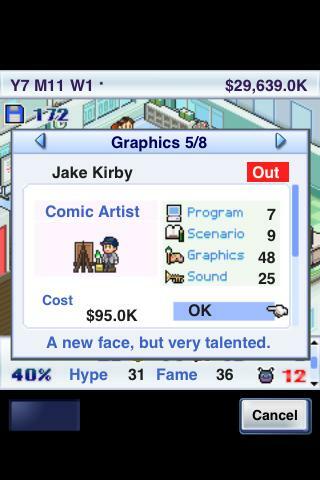 Game Dev Story is a slow paced game that I wouldn't recommend to anyone who finds management or simulation games tedious. Also due to the nature of the game it is highly repetitive, particularly early on in the game before more options open up to you. There are also free demo versions available to download on the appstore and Android market for those that want to try before they buy.